In my personal work I like to explore the beautification and ornamentation of words, often through practices that could be described as lovingly obsessive (or, occasionally crazy). Investing time in anything gives it value, and I enjoy the process of dialing up the value of language. 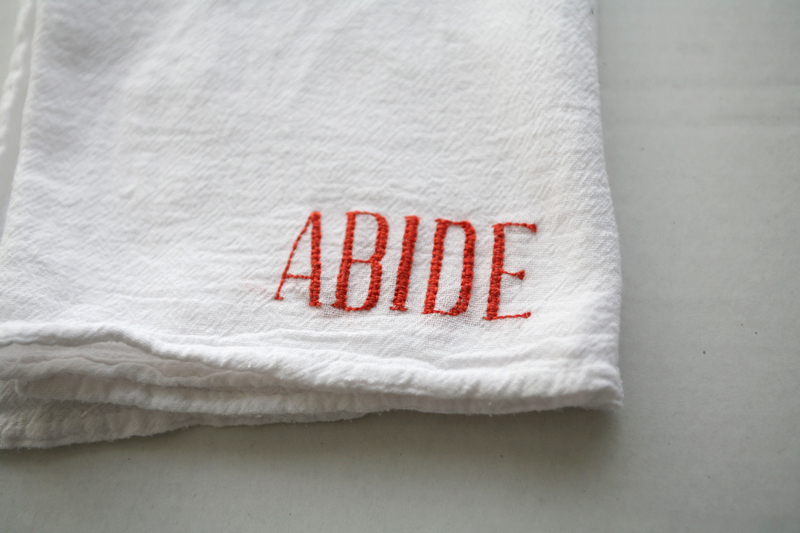 Embroidering these towels was a time-consuming diversion in the midst of college finals, but the undertaking became a sort of meditation on this word abide — what it means to continue without fading, dwelling in a practice of expectation. It was also important to create a piece that could be divided and taken to different homes as functional objects. Abide existed in the gallery as a series of twelve tea towels, but beyond that show they became individual and personal items.